Beyond lettuce, vermillion paint and stuffed frogs, defining ‘green’ for products can be difficult. First of all, the word itself has no agreed-upon definition. Should it refer to recycled, local, energy-saving, or involve a complete life cycle assessment to the molecular level? Perhaps the solution is not to judge. What’s the Green Deal?, the sustainability brand for London Drugs, developed and guided by Unicycle Creative , has never proposed to be a certification system. Maintaining the brand itself as a question means the team should always be looking to find out more, and share knowledge with customers. As What’s the Green Deal? has evolved, it became evident that it would naturally move further up the supply chain. Working with Reeve Consulting, a purchasing policy specialist, London Drugs recently formalized the product attributes and qualities it expects from vendors. Unicycle Creative is involved in naming and communicating the program, as well as developing the vendor document system for collecting product information. Third Party Certifications – Recognized standards like Canada Organic, FairTrade Certified, Energy Star and EcoLogo let the team know that other organizations have done their homework. Self-Declared Environmental Claims – London Drugs will recognize vendor claims if the documentation and website evidence appears to back them up. Recycled content, biodegradability and natural ingredients are examples of such claims. Transparency – Can all ingredients and materials (including categories like colour and fragrance) be sourced on the packaging or the company website? Transparency is one of the key factors in engaging genuine green trust. Especially on any products that go in, on, or around our families. Corporate Responsibility – It’s hard to buy green products from a brown company. Social and environmental programs at the corporate level, company vision and other policies play a part. CSR reports and certifications such as B-Corporation are designed to formalize these policies. It’s just greener. Duh. – Sometimes green just makes sense. Rechargeable batteries, compost containers and other products that help people live a little greener are worth pointing out. 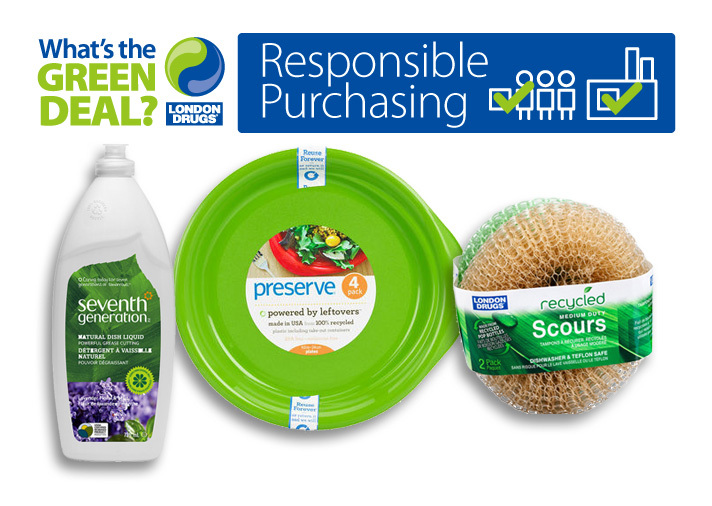 If you want to find out more, visit GreenDeal.ca to see London drugs’ Responsible Purchasing Policy. Here’s where we spout the obligatory ‘sustainability is a journey, not a destination’ line. Trite, but true. As standards evolve, What’s the Green Deal? will evolve with them. Hopefully helping create so many green products we won’t be able to feature them all.